However, it has changed and continues to change immensely. Many of my contemporaries slipped into the sector when qualifications were less necessary and more generic. More than one of my peers who started as a community arts officer like me ended up as a university lecturer writing the curriculum for the study of the practice they had pioneered – without specific qualifications (except the odd Arts degree or so). Nowadays that doesn’t cut it – to survive and make a living, you need skills and expertise and qualifications. This is in a sector that is changing rapidly and that is easily affected by its political, social and economic environment. A vast transformation of contemporary culture not seen since the breakdown of traditional arts and crafts in the industrial revolution is under way due to the impact of the digital and online environment. Artists, culture managers and cultural specialists today are confronted with radically different challenges and opportunities to those they faced in the 20th Century. The first is the growing importance of the knowledge economy of the future. The second is the increasing importance of our immediate region, including the Pacific, in the Asian Century and the third is a set of major constraining factors affecting cultural organisations. These mutually reinforce each other to produce a cumulative long term impact, while, at the same time, there is no strategic policy or overview guiding governments. Government support for cultural activity is in flux, with a high level of uncertainty and substantial change which has to be factored into strategic planning. Government cultural funding has been steadily trimmed over the last five years and it is not being adjusted for inflation. There is a tendency for governments to move away from organisational or operational funding towards one-off project funding. The impact of the efficiency dividend on major cultural institutions is cutting deeper and deeper. This is particularly damaging because of its cumulative effect, in the same way compound interest works – except in reverse. Each reduction is a reduction on the previous reduction. While funding is stagnating – or dropping in real terms – Australia’s population and economy continue to grow steadily, further reducing the ability of programs and organisations to respond to the demands of a bigger nation. · We need to establish new models of support for creativity and culture. For long term viability, limited government support needs to be supplemented by private and community resourcing, leveraging limited government funding to generate much higher levels of support. Forty years of creeping neo-liberal economics has had disastrous impacts on support for creativity and culture. · Grasping that a focus on the economic role of arts and culture is not all bad, as long as it is seen as similar to a focus on its community role – both spring from recognition that creativity and culture is integral to everyday life and the essential activities that make it up. · The productive role creativity and culture plays makes it imperative it is included on the main national agenda, recognising its integral relationship with major economic and social factors such as economic development, education, innovation, community resilience, social and community identity and health and wellbeing. · The cultural sector is adept at communication. It deals in the expression of fundamental values for our society, using language and images, stories, symbolism and emotion. · Creativity and culture is increasingly linked to the broader knowledge economy and to the creative economy within it. The knowledge economy, home to the clean and clever industries of the future, is a natural fit for creativity and culture. 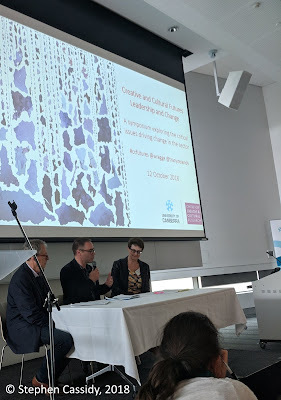 · Where the creative and cultural sector differs completely from other knowledge economy sectors is that, because it is based on content, it draws on and contributes to Australia’s culture and is a central part of projecting Australia’s story to ourselves and to the world. In that sense the creative and cultural sector has a strategic importance that other sectors do not – it has a critical function managing meaning. · Interconnection and interaction are critical – the lateral connections between different components of the sector – and areas beyond – help map out a potentially promising and influential future. · There is an important connection between our cultural institutions and the creative economy. Access to the collections, knowledge and expertise of these institutions can help fully realise its potential. Cultural diversity fosters innovation, which occurs where cultures intersect and differing world-views come into contact. Looking at how the issue of Traditional Knowledge is being addressed and going further, one of the most important economic resources of Indigenous communities is their culture. Through the intellectual property that translates it into a form that can generate income in a contemporary economy, this shows some promise of contributing to the future sustainability of these communities. It mines a far richer seam than coal or iron – authentic and rich content that has been recognised internationally. Creative firms and outlets are already developing which draw on that cultural content. · The features of the new order, such as massive interconnection, a heightened relationship with audiences and far greater flexibility of creative content, offer immense opportunities. · Cultural programs, membership, online presence, partnerships and marketing, and promotion and sales have to interact seamlessly, as a way of multiplying the impact of limited government funding and overall resources. For those developing careers in the sector, these major challenges open up opportunities to work on the main agenda – and in areas previously hard to access. It’s about leadership and influence at many levels in cultural organisations and in the creative and cultural sector, but also in the wider community. Making the most of this will be critical to both the professional future of those working in the cultural sector – and to the shared future of Australia and the world. Presentation at ‘Creative and Cultural Futures: Leadership and Change’ – a symposium exploring the critical issues driving change in the creative and cultural sector, University of Canberra, October 2018.